The HOSPs around my house seemed to have abandoned my feeder for now. Nothing in the trap for several days either, as the warm weather moved in. Caught 47 in the week before the warm spell, but saw at least that many in flocks in my yard during that timeframe. Two juncos and a wren early this morning… At least the wren and the juncos had no problem finding the door as soon as I opened it! And I do have the trap setting 3′ off the ground on a plastic garbage can. Baiting with white millet I got from a local garden center store, as well as sunflower chips that are normally in my feeders. Glad you are setting up again, Tammy, so I have have someone to compare notes with. This reply was modified 3 years, 4 months ago by stumpy75. Put my trap out. Right away caught 3 juncos and then 2 again later. I’d better try raising my trap. Although I never have anything at home to put it on. I could put it on 5 gallon buckets but they are usually are white and then a raccoon will come by and topple it over. I’ll look in my garage and brainstorm. I usually keep it on the ground with great results but so far just juncos. I have mine on an upturned plastic garbage can about 3′ off the ground near where they sit before flying to my feeder. I have a piece of plywood under the trap. I started with the trap on the ground, but I was catching a lot of juncos and a few wrens. Then I went to some concrete blocks, but was still catching juncos. When I got it up on the garbage can, I’ve only caught HOSPs. I’ve thought about getting a post to mount it on. I use a pellet gun to dispatch them, and it is quick and humane. I use a wheelbarrow to move the trap into my garage overnight, where the temperatures stay about 20 degrees above outside. So far this winter, that has worked well. I try to keep two decoys, as they seem to roost together at night for warmth. I’ve caught 41 in the past 5 days… 209 since mid-summer, when I got the trap. But I have at least that many in a pyramidal arborvitae hedge in my back yard. I got the trap to reduce the HOSP population in that area. In the winter, the ground under that hedge turns white(and not from snow!). The hedge screens my garage and, in the summer, my RV, so I don’t want to remove it. Since I’m home more in the winter, I have the trap out constantly now, as in the summer, I was always going to one place or another. Some day I’d like to try a bluebird house, but that’s just not possible right now. But, my cooper hawks and raccoons are eating well! 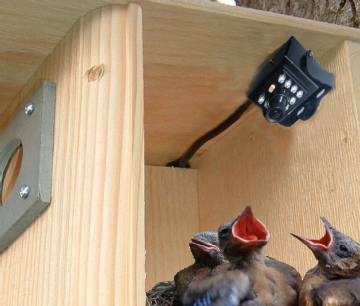 Chris, you can successfully have a bluebird nestbox, even with an abundance of HOSP. Maybe I’ll be better if you keep me accountable. During that first year I was on a forum and we were in competition with each other so it spurred me on. But I’m showing you this to say that you can successfully have bluebirds. It is a little more of a battle for those with a lot of hosp like us but I’ve had great success. If you wait until you your numbers are low….you’ll never do it. I live 5 miles away from Anderson’s grain elevators and I’m wondering if that is an issue even though it seems far enough away. 209 since mid summer is amazing!! I plan on putting up a bluebird box in the spring, even if I have to clean it out a lot. I average about 7 HOSP per day, and the numbers haven’t backed off yet. Even yesterday, in the rain, I got 7, and in 4 hours this morning, I have another 7… I also had a female cardinal somehow make it into the elevator yesterday. Luckily, I was actually watching the trap when she entered it, so I was able to get her out quickly. This was even with my greatly reduced opening! If we were having a normal winter, I think tending to the trap would be harder, but I don’t really mind the cold that much. I’m out walking somewhere almost every day. Even tried snowshoeing last year, for the 1st time in about 30 years. I get cabin fever real quick, so getting out in most weather is not a problem for me. Don’t clean out your future bluebird nestbox. Buy a Van Ert trap on line at http://www.vanerttraps.com/. Trap those house sparrows after they start building. A life saver!!! If I was only allowed to own one trap it would be this one. 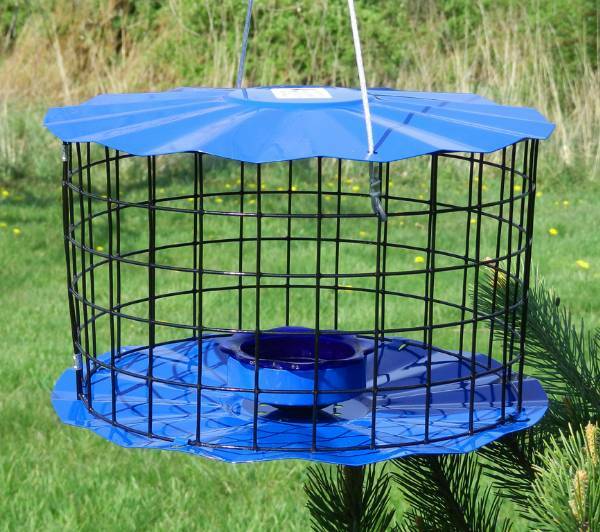 They are very inexpensive little traps that you put inside your nestbox. Chris, great you have trapped so many. 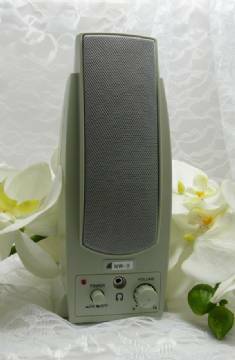 I have two DRST’s that I use on and off, but have most success trapping HOSP in the fall and winter months. The one DRST I have was built special for me by Blaine and is modified to have a slightly wider trap elevator to allow easier trapping of European Starlings (they hit traps winter months only and only when the snow flies). HOSP Juveniles are especially easy to trap early fall when nest season winds down too. I generally use white bread as bait, but you are having better success than me right now – are you using millet and peanuts? What is your bait of choice? I like that you have put plywood base under trap to keep them a little warmer if trap is elevated (like leaving trap on ground as Tammy said). I find my decoys have better longevity during winter months than they do during nest season here in central Ohio. Keeping them dry is the most important thing. At night, I leave my traps out and cover them with old heavy rubberized door mat which protects them from rain. If heavy snow in forecast, cover entire trap with sheet at night. You can also bring them into your garage (newspapers under trap for easy cleanup) if an especially bad rain event is forecast or if you have real bad raccoon issues in your area (not a problem in my yard). Chris, AMEN to what Tammy said about buying a VanErt in-box trap. They are the best thing invented I think. I don’t do a lot of ground trapping in the winter, due to my age and severe weather. But I have done some, usually only to catch everything except HOSP!! But come spring & nesting season a Van-Ert in-box trap is essential – I even have two and use them on different boxes at the same time. Welcome to the forum! I generally use white bread as bait, but you are having better success than me right now – are you using millet and peanuts? What is your bait of choice? I use the same bait as what is in my feeder, as they are mobbing it right now. It’s mostly hulled sunflower seed, mixed about 4:1 with white millet. (4 scoops sunflower to 1 scoop millet). I get a 50lb bag of the sunflower for about $51 at a local seed store(Oaks Feeds), and the white millet at a nursery which stays open in the winter with bird feeding supplies(Black Diamond, $0.29/lb). I also have tried just straight millet, but if it’s windy at all, it just gets blown out of the trap… I’m going to try some bread though, as maybe that will be a nice change in windy conditions. I’ve been taking my trap into the garage at night, but that’s getting to be real work, so I think I’m going to try and just find something to cover it with. I might have an old mat around here somewhere. They do make a mess of the plywood that I put under it, so I’ve got several different boards to put under the trap, especially when taking it in the garage. And, yes, newpaper when in the garage… I’ve even taken the boards to a spray car wash(in the back of an old pickup ) to clean them off. Shouldn’t have to do that in normal weather, but since we have been really dry this year, they don’t seem to get cleaned naturally. With the forecast winds(>50mph gusts) and rain we had a few days ago, I pulled the trap completely for a day, and the next day, had no takers… Maybe they were recovering from the blow, as my feeder didn’t have much activity either. I’ve caught another 48 since 12/20(254 total), and there are hundreds more around the yard. Carol – Mid-Mo and Tammy: I’ll take a closer look at the VanErt trap as spring gets closer. Sounds like a winner! This reply was modified 3 years, 3 months ago by stumpy75. I don’t have mine out. I had put it away for company and never got it out again. I so need to start trapping. With tomorrows snow I’m not sure if it’s worth putting it out tomorrow. I use the same type of seed for mine. I pulled mine tonight because of the possibility of early morning snow. I’ll put them back out after it stops. I ended up getting a second trap, but it looks like I have it in the wrong spot, as I’ve caught nothing but juncos. I put the new one out a couple of days ago, so I’ll try another area when I put it back out. My original trap, in the original spot, is still trapping them fairly regularly(another 30 since the first of the year). The trapping has slowed some, and I’m not seeing as many HOSPs around, so maybe I’m finally making a dent in the population. With it looking like we are now going to really see more winterlike weather in the next few weeks, it will be interesting to see how many I trap. I’ve also watched several chickadees get onto the elevator, but they seem to be too light for it, and it just goes down a little bit, which scares them enough that they bolt out of there really quick! That’s fine with me, as I don’t want to trap them anyways! I have put a trail camera out pointing towards my compost pile, where I have been disposing of the HOSPs. Cats, opossums and raccoons seem to like the area now, as well as an occasional Coopers Hawk.